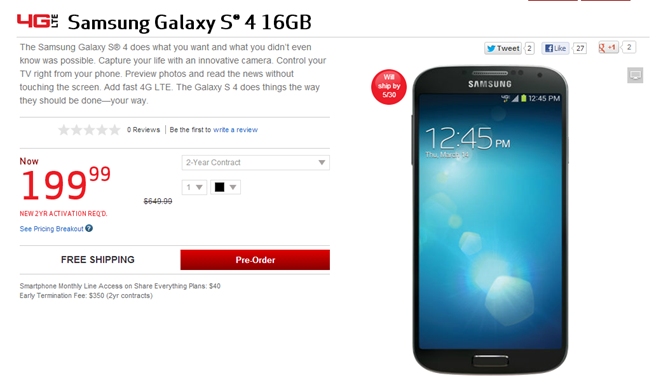 While Galaxy S4 pre-orders are already well underway for most other carriers, Verizon joins the party today – fashionably late as usual. You can get the 16GB version of Samsung's newest flagship on the country's largest provider of LTE for $200 – but you'll have to wait until May 30th to actually get the device in your hands. That's basically a full month later than most other carriers. Par for the course in Verizonland, though. If you can handle the delay (or just can bear the thought of leaving Verizon for another carrier), then you can secure your GS4 below. Keep in mind, however, it looks like the 16GB version is the only one available right now, as the 32/64GB versions are nowhere to be found. Update: The pre-order page is now showing $249.99, but Verizon's news release mentions a $50 mail-in rebate, so the end result should still be $199.99, just with 100% more PITA. 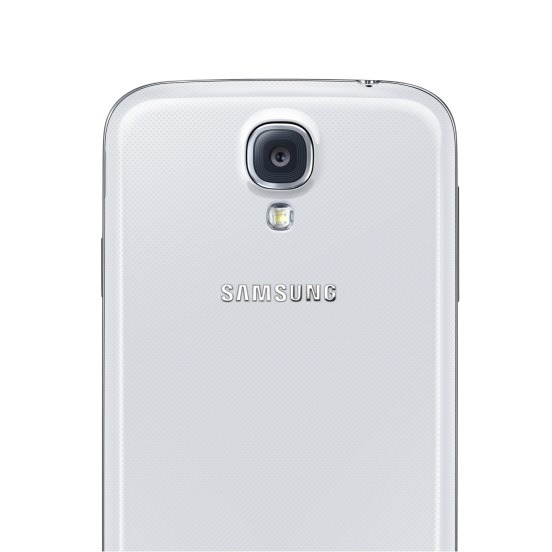 The Samsung Galaxy S® 4 is now available for pre-order online for $199.99 after a $50 mail-in rebate with a new two-year customer agreement. The smartphone will be available for purchase online and in Verizon Wireless stores starting May 30. The Galaxy S 4 introduces new photo features like Dual Shot, paired with a 13-megapixel rear-facing camera to take professional looking photographs. Dual Shot allows the use of both the rear and front facing cameras at the same time and lets phone users to include themselves in pictures or videos. The Galaxy S 4 is Global Ready and can travel overseas with anyone, but the software may make it an essential item for the world traveler. S Translator™ operates as a multilingual pocket dictionary native to the phone, translating words and phrases when typed or spoken into the app. Other apps on the Galaxy S 4 include WatchON™, which turns the smartphone into a home entertainment remote and personal TV guide. Air View™ and Air Gesture let users interact with their smartphone without even touching it. Hovering a finger over the screen lets users preview emails and waving a hand over the phone can scroll up and down a webpage. Customers can choose between two color models, Black Mist or White Frost. Additional product information can be found here.